JUST LEASED: Palace Place, Suite 703 for the RECORD PRICE of $4,650 per month! I have written to announce that I have set yet another all-time record price at Palace Place by having just leased Suite 703 for $4,650 per month. 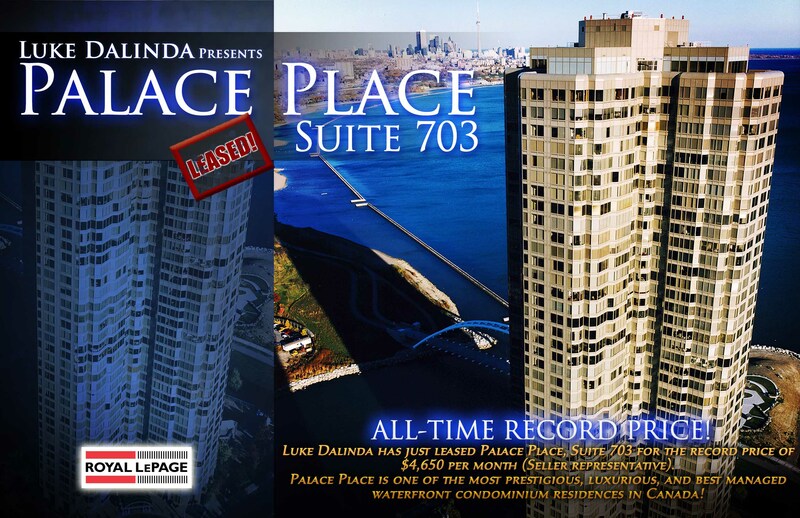 This entry was posted in Palace Place Rentals, Palace Place Report, Uncategorized and tagged 1 Palace Pier Court, Luke Dalinda, Palace Pier, Palace Place, Palace Place 03, Palace Place city view, Palace Place condos for sale, palace place floor plans, palace place floorplans, Palace Place Toronto, Palace Place water view, Palace Place waterview, PalacePier, PalacePlace, palaceplace.com, Toronto Life Palace Place by ldalinda. Bookmark the permalink.